EFL teachers need to be careful in their decision on the selection of cultural content for ELT classrooms. To address the issue, this paper investigates the design guidelines to evaluate textbooks as sources of cultural content in the ELT curriculum. The paper is organized in two parts. In the first part, the notion of culture and the important factors are discussed. Then, taking these factors into consideration, guidelines are designed to evaluate a textbook for cultural content. Culture in English language teaching materials has been subject to discussion among professionals and teachers for many years. Some teachers want to have cultural content in their language classrooms and similarly students may wish to acquire the cultural knowledge, which enables them to engage authentically with the language use of a particular native-speaking community. But there seems to be no sensible reason for insisting on this in the process of language learning. Native speakers may write textbooks and teachers' books, prepare cultural content, may be strong advocates of absolute authenticity in the materials, and make pronouncements and recommendations. However, their English is that which is associated with the communicative and communal needs of their community, and may not be relevant to those learning English as an international language. Also, their teaching may be suited to particular contexts of instruction which in many respects are quite different from those which we experience in the world. Teaching materials are proper to the extent that they are appropriate to learners' needs, not the extent that they have to be appropriate. A society's culture consists of whatever it is one has to know or believe in order to operate in a manner acceptable to its members, and to do so in any role that they accept for any one of themselves. That knowledge is socially acquired; the necessary behaviors are learned and do not come from any kind of genetic endowment. The term 'culture' will be used in the sense of whatever a person must have in order to function and live in a particular society. This includes also socio-cultural factors in the language teaching materials. The first question to ask ourselves considering socio-cultural factors in our language teaching is whether we should include socio-cultural factors in the teaching process (Wardhaugh, 1992). If the answer is 'yes', the questions of how much socio-cultural information should be given to learners and what kind of techniques should be used need to be answered. Whether you give sociolinguistic information you, as a teacher, also talk about the target culture (TC) in the classroom The target culture does not need to be English or British culture and should include a variety of cultures. While considering these questions, learners' needs, characteristics and aims should be taking into consideration. Consider the students' needs. What are they going to do with the target culture? Look at the students' previous learning experiences. Then look at the learners' characteristics (Age, educational level, attitudes, socioeconomic status). Consider the attitudes that the students have towards learning the target language. Teachers should make the learners learn about the cultures and why certain things happen in other cultures. They should not try to make their learners think or become like people in the cultures presented. They should not give the idea that one's own culture is better than the target culture or vice versa. They should point out that cultures differ. Foreign language teaching textbooks no longer just develop concurrently with the development of foreign language pedagogy in a narrow sense, but they increasingly participate in the general cultural transmission with the educational system and in the rest of society (p. 90). Since the underlying system is not explicitly stated, it requires us to look at course books in detail to understand the unstated values. Stereotypes can be defined as 'the conventionalized ways of talking and thinking about other people and cultures' (Kramsch 1998: 131). Stereotypes may result in learners whose cultural ineptitude will affect detrimentally their personal language acquisition (Clarke and Clarke 1990: 31). While analyzing a course book in terms of stereotypes, it is necessary to identify unrepresentative negative stereotypes, representation of women and men and gender differences (Cunningsworth 1995: 91). A certain degree of generalization is acceptable within certain genres of large-scale cultural interaction. But problems occur when we apply these general interpretive pegs to immediate situations and personalized discourse' (p. 158). So, reducing culture to a few generalizations and ignoring other features of genre will result in offending our sensibilities. Does the book give any information, instructions or suggestions about how the book may be used and how the cultural content may be handled? Does the book address specific learners or are there any characteristics of the learners that the book addresses to? Does the book suggest any role that the teachers using it should have? Do they include a variety of cultures or just specific ones such as British or American culture? Do they represent the reality about the target culture or the author's view? Where is the cultural information taken from? Author's own ideas or empirical research? What subjects do they cover? Are these specific to the target culture? Are there any topics that might not be culturally suitable for the learners in class? What cultural and social groups are represented? Is this adequate coverage of a variety of people or is this limited to a chosen people? If so, what kind of people are these? Are there any stereotypes? Does the book include generalizations about the culture? Does it inform the audience of the fact that what is true of the parts is not necessarily true of the parts? Is the cultural information presented with comments such as being good or being bad? Or is it presented without such comments? Are there illustrations? If so, are these appropriate to the learners' native culture? Would additional information be necessary to explain them or are they self-explanatory? What are the activities asked of the learners? Are they familiar to the learners? Would a teacher using this book need specialized training to be able to use it or is there enough information given? What are the learners supposed to do with the cultural information such as using actively or just be aware of it for a better understanding of the target culture? What is your overall view of the textbook? Any language is embedded in a particular culture and when you learn a language you inevitably learn about its underlying culture. However, the case is different for English since it has become an international language. While inserting 'culture' in the curriculum and using textbooks having cultural content, teachers should be aware of the factors such as socio-cultural information, learners' needs, stereotypes, generalizations and intercultural communication. Before using any source of cultural content such as textbooks, teachers should take these factors into consideration and analyze the material to understand whether it is appropriate for their learners and whether it tries to impose specific cultural information on the learners. In this paper, I tried to design guidelines taking the cultural content and new trends into consideration they may be developed and changed to meet different needs of various students. Alptekin, C. 2002. 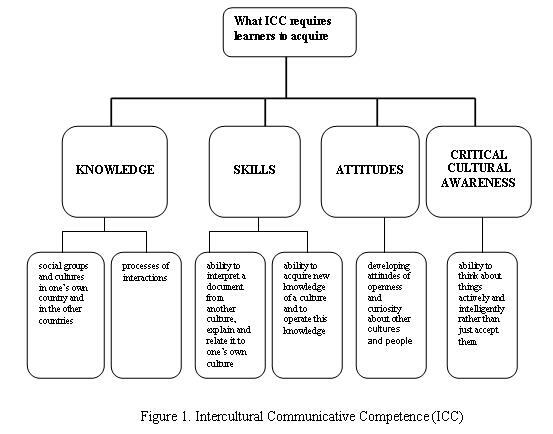 Towards intercultural communicative competence in ELT. ELT Journal 56/1: 57-64. Byram, M. 1997. Teaching and assessing intercultural communicative competence.Clevedon: Multilingual Matters. Clarke, J. and M.. Clarke. 1990. Stereotyping in TESOL materials. In B. Harrison (Ed. ), Culture and the language classroom (pp. 31-44). Hong Kong: Modern English Publications and the British Council. Cunningsworth, A. 1995. Choosing your coursebook. Cambridge University Press. Guest, M. 2002. A critical 'checkbook' for culture teaching and learning. ELT Journal 56/2:154-161. Holly, D. 1990. The unspoken curriculum, or how language teaching carries cultural and ideological messages. In B. Harrison (Ed. ), Culture and the language classroom (pp. 11-19). Hong Kong: Modern English Publications and the British Council. Kramsch, C. 1998. Language and culture. Oxford University Press. Leather, S. 2001. Training across cultures: Content, process, and dialogue. ELT Journal, 55/3:228-237. Straub, H. 1999. Designing a cross-cultural course. English Teaching Forum 57/3: 2. Tavares, R. & I. Cavalcanti. 1996. Developing cultural awareness in EFL classrooms. English Teaching Forum, 34 /3: 18. Wardhaugh, R. 1992. An introduction to sociolinguistics. USA: Blackwell Publishers Ltd.